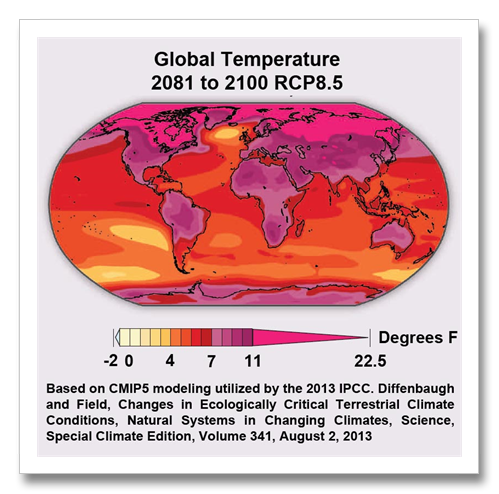 Climate change projected by the IPCC 2013 report under the business as usual scenario (RCP8.5) projects climate change in the next 100 years to be as big as the Paleocene/Eocene Thermal Maximum extinction event 56 million years ago. Changes today however are happening 100 times faster than the PETM. The PETM was likely a methane clathrate melt event where frozen methane (natural gas) on the ocean floor melted. The event happened over a time period of about 10,000 to 20,000 years and resulted in an extinction event centered on the world’s oceans. Nearly half of all life in the oceans perished as the methane melt increased ocean acidity beyond the threshold of life for those organisms. Ten million years before the PETM, a giant asteroid hit the Yucatan Peninsula and the dinosaurs, along with 75% of life on Earth, went extinct. Since the asteroid impact, mankind’s climate change stands alone. The dinosaur extinction event is difficult to compare with what is happening today. What happened 65 million years ago? That 6 mile wide asteroid blew out a crater 110 miles wide and threw enough dust in the atmosphere to block the sun for a year and photosynthesis failed. The red-hot ejecta from the impact fell back to Earth and burned most of the planet. What didn’t die during this cataclysm died from climate change caused by the massive increase in atmospheric carbon from vaporized rock and global fires. So climate change today is second in severity in the last 65 million years only to this extinction event which was the worst in 250 million years. There is another definition of the speed of climate change. What the authors of this paper from Stanford tell us is that the speed of climate change is also the rate at which living things must migrate (northward generally) to stay even with the temperature range they evolved in. Under the IPCC scenario RCP8.5, which basically mimics greenhouse gas emission over the last ten or fifteen years, by 2046 to 2065 high latitudes in North America will experience 9 degrees F of warming and 5.5 degrees over much of North American and Asia. By 2081 to 2100, most of North American and Asia experience 11 degrees of warming and high latitudes, 22.5 degrees. More than half of the time by 2046 to 2065, the average summer temperature will be hotter than the hottest summer of the 20th century. By 2081 to 2100, 80 percent of summers will be hotter. What all of this heat will do, (and is likely already as described in other research) is to cause mass migrations and or extinctions. Those organisms on our planet that live outdoors and aren’t fortunate enough to have climate control systems they can implement with the flick of a switch will have to move when it gets too hot. An example is a spruce forest in the Rockies. Spruce grow at elevations between 8,500 and 11,000 feet in the Central Rockies. As the temperature warms, the altitude that has that temperature range that is just right for the spruce moves higher up the mountain. By the mid 21st century, it will be warm enough in the Rockies that the “Goldilocks” zone for spruce will be higher than the tops of the mountains. This will effectively cause the extinction of spruce trees in the central Rockies. The Clark’s Nutcracker (named after Captain William Clark of Lewis and Clark), that lives only in the spruce forests of the West can migrate farther north when the temperature warms. Some will likely die because the spruce forests farther north have different trees and other organisms than the spruce forests of the Central Rockies. The habitat is different. The Clark’s nutcracker is a lucky bird though. It is an opportunist that can adapt. But most birds and other organisms are not so diverse. The speed that the Clark’s nutcracker will have to fly north to keep up with it’s Goldilocks temperature range is what is called the “speed of climate change.” The speed of climate change across most of North America is 5 to 10 miles per year. Another surprise from this research comes from the tropics. Global warming will impact the tropics the least and this has been shown to be happening already with less warming in the tropics than anywhere on Earth. But because climate in the tropics is so stable, the life forms that have evolved there have a low tolerance for change and small changes will have big impacts.